Are you looking for a credit card because you have been turned down previously? Well, with the Cerulean credit card issued by Continental Finance you can rest assured they will try anything possible to see it that your chances will be considered. They have partnered with Discover and MasterCard for the Cerulean Card. Make Low Monthly Payments on all your card purchases! This card does not have a typical introductory APR’s like most credit cards do. There is an annual fee of $75** for this card. 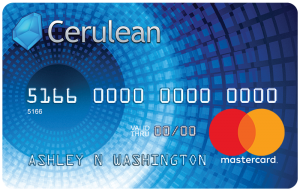 The Cerulean MasterCard issued by the Continental Finance company has come up with a card like their Matrix, Reflex, and Verve cards. The Cerulean is geared to people that have poor credit. As with any card you should always review the terms of conditions. This card has attached fee’s for it’s membership.